During the 1990s, around the time of the ThunderCats’ resurgence in popularity courtesy of the show’s heavy rotation on Cartoon Network, a series of soundclips emerged on the Internet. These soundclips contained outtakes from various ThunderCats recording sessions, and featured most of the voice actors from the series either fumbling or forgetting their lines, ad-libbing or just playing around. These outtakes have been confirmed as real by ThunderCats voice actor Larry Kenney (the voice of Lion-O, amongst other characters). Larry has stated publically that he feels very badly that these outtakes have been made available on the Internet where they may be heard by young ThunderCats fans, due to the sometimes colourful language that appears throughout them. Nonetheless, they do provide a great insight into the fun, relaxed atmosphere prevalent in a ThunderCats recording session, and do also provide some really funny moments! Enjoy! PLEASE NOTE: These soundclips contain strong (foul and sexual) language, and as such are not suitable for people under the age of 18. 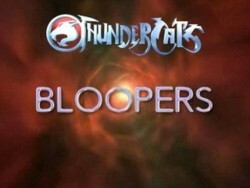 Following the release of Warner Brothers’ ThunderCats DVD releases, fan Michael B. Ryan put together a special “blooper video”, featuring the ThunderCats outtakes set against video footage from the DVDs. This video is hilariously funny and well worth seeing!